In France, we call an open kitchen a cuisine américaine (an American kitchen). It is, for some reasons, very fashionable to have one in France but having gone through 3 different types while living in San Francisco, Upstate New York, and now in Philadelphia, I can say that it's great for people..... who don't cook! While I enjoy being able to be in my kitchen while keeping an eye on my kids or talking to guests, there is something I really don't like about open kitchens: that it's, well, open on to the living room. There is nothing more annoying to me than having the feeling that I am cooking "in my living room". I feel that our whole apartment smells like food. And even if most of what I cook do indeed smell nice, it's not true when it comes to fish. We eat fish (or seafood) at least twice a week but I just can't take the smell of pan-seared fish (and I am not even trying to grill Spanish mackerels!!). What about the hood, you may ask? My 70s-never-updated-rental-kitchen being what it is (old, energy in-efficient, small), the hood makes more noise than it actually traps fumes. In other words: useless! I have tried scented candles (but some give me headaches).. so my best option to get rid of the smells is to make a draft: opening the windows and the door to the hallway. At least, my neighbors get to enjoy the smell of what we cook (ahah!). As a result, because I can't change my kitchen, I have come to change my recipes! In this recipe, the salmon is cooked on a skillet in the oven. Fewer fumes in the apartment... maybe more oven cleaning (tough luck, no auto-clean feature any more : it broke down the other day, (argh!!)). 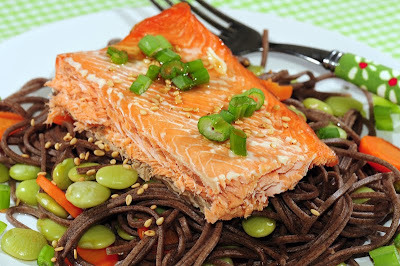 I serve the salmon over buckwheat pasta (found in the form of Soba noodles (a mix between wheat and buckwheat)). Buckwheat (which we call Blé noir (black wheat) or Sarrasin in French), I recently discovered, has nothing to do with wheat. It is not a cereal but a fruit seed that is related to rhubarb and sorrel! Buckwheat is really high in proteins and magnesium. It also helps prevent cholesterol. If not mixed with wheat, buckwheat flour is gluten-free. In other words, very good for you. In France, we use buckwheat flour to bake salty crepes (galettes de sarrasin). I discovered Soba noodles in one of my (numerous) dinner at Japanese restaurants in San Francisco. Soba noodles cook VERY fast, much faster than regular wheat pasta. It makes this a very easy, healthy, fast, and (almost) odor-less recipe. Besides, my children love it! What else do you want? Give it a try! Bon Appétit! Pre-heat the oven to 350F. Pour some sesame oil in a skillet and once the oven has reached 350F, put it in the oven. In the meantime, pour water in a pot, add the carrot, salt, and boil the water. Put Salmon on top and serve immediately. Soba noodles are found in the Asian sections of most supermarkets. Soba noodles do poorly when re-heated. If you have leftover salmon, cook fresh pasta the next day.